Looking for Daniel Fast tacos? You’ll love this recipe for southwestern black bean tacos. They’re delicious! 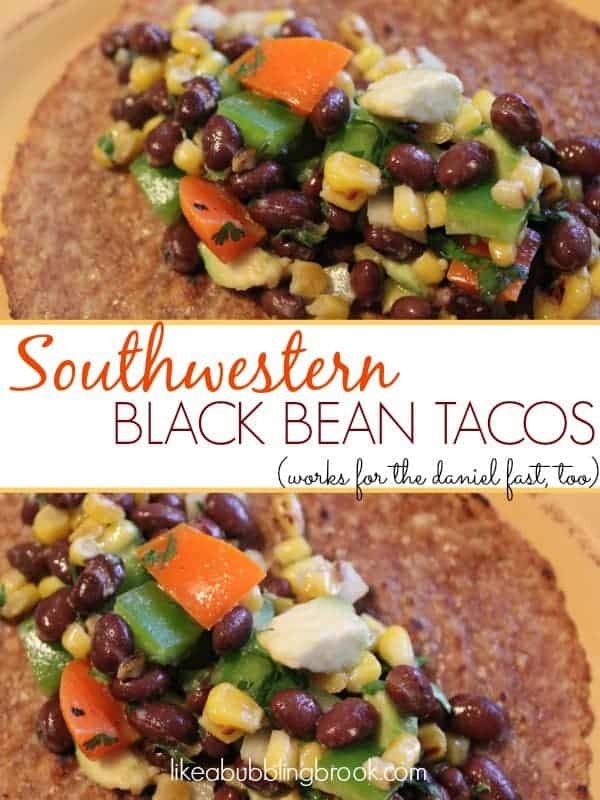 We’ve made different variations of these healthy black bean tacos for years, especially as part of our Daniel Fast meal plan. For awhile, I served this just as a bean salad, chilled. Then I made it without a couple of the ingredients and served them in whole wheat tortillas. Now, I’ve tweaked them a bit more, and think they taste best served on some Ezekiel sprouted grain tortillas, lightly toasted in an oiled cast iron skillet. Mmmm! Lots of southwestern flavor! For the family members that prefer meat, it also works well with a bit of shredded chicken thrown in. Whisk the first three ingredients (for the dressing) in a small bowl; set aside. Heat a lightly oiled frying pan over medium high. Lightly toast corn until spotty brown but not charred, about five minutes. Remove from heat. In a large bowl, add the remaining ingredients and the toasted corn. Drizzle with the dressing and mix well. Season with additional salt and pepper if desired. In the same skillet that you used to toast the corn, heat about three tablespoons of oil and lightly toast the Ezekiel sprouted grain tortillas , one at a time. You may need to add more oil to the skillet as you go. Spoon the bean mixture over the tortillas and serve. Jamie this looks delicious! I'm definitely going to try this as we are trying to incorporate more vegetarian options into our family meals. Thanks! these look so yummy I'm making them this week for sure. The perfect recipe for the perfect lunch!! 🙂 Making them this week! also- wanted to mention I host a weekly Recipe event entitled Seasonal Sundays Each week- and this recipe fits the theme quite nicely! Would love you have you participate. This looks so yummy! I am going to have to try it!! It looks very yummy! I have to try this. I like to use the Ezekiel tortillas as well. Yum! As an Irish gal married to a Mexican husband, I will be making this. I usually make make homemade corn tortillas, but will try the Ezekiel tortillas. @Sweet Apron, I'm sure homemade corn tortillas would be delicious, too! I just made this for dinner tonight and it was delicious. I also added chicken seasoned with salt, pepper and cayenne pepper. It was so good. My husband told me that I have to make it again. Yay! Happy you both enjoyed it, Kathy! How many servings do U get???? I’m at the end of wk 1 of the Daniel’s fast and needed more recipes so I can shop and prep it for next week! I’ve been doing pretty good on the fast ( just the coffee part has been the hardest! ) I can feel the effects of the little tweeks in my diet and lifestyle so I’m continuing on with hopes of more victories and closer walk with Jesus as this old flesh gets disciplined.